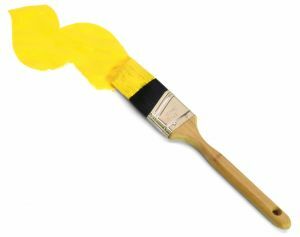 Brush is a batch of flat hair fixed in a hand-holder for applying paint, glue, varnish… on a surface. Master always takes the choice of work instrument that is brush very seriously. There’s a great variety of brushes and one should have a clear understanding of the ways this or that brush is exercised keeping in mind the material and technique is used. Depending on concrete producer size of brushes can be different, for instance, according to diameter of hole of crimping box. Handhold is usually produced of cheap wood and depending on the sphere of appliance might be long or short. Line-wise: longer than the round one. Applied for long strokes, definite lines, ideal for writings. Cat tongue: flat brush with contour, used for different purposes. Can be applied as an ordinary round brush and in vertical position towards surface as a round one as well. Ideal brush for very definite stroke. Functions of all brushes are directly interconnected with batch-form. One chooses brush according to the material involved – oil painting, water colors, gouache, Indian ink … Brushes can be soft and hard, natural and synthetic, thick and thin. For water colors and gouache are good brushes from Siberian squirrel, while water colors, gouache аnd oil painting are better used brushes from Siberian and Chinese striped weasel. Gouache and Indian ink demands pony brushes, glue and water-soluble painting are fine with goat brushes. Synthetic and bristke brushes fit oil and acryl paintings. Ancient China with Japan made brushes of fallow deer, raccoon, musteline , hare, cat and goat hair . Data shows that in IV century fur Chinese rats was used as well. Be careful when using brush as hair in the butch are fragile. If few hair fracture even pincer can’t guarantee that the work won’t be spoiled. Try to avoid afflux of dry painting on the butch close to the crimping box or inside it, each time after use clean the brush. Choosing the brush prove that crimping box is safely fixed on the hand-holder. Three indicators show brush quality: sharp end, elasticity and fluctuation control. Brushes sold with safe end caps, could have a damaged brush butch if the end-cape was removed, then put on again or replaced. Before buying the brush test it in work.